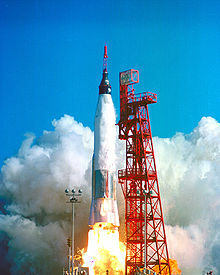 Mercury-Atlas 6 (MA-6) was the first American orbital spaceflight, which took place on February 20, 1962. Piloted by astronaut John Glenn and operated by NASA as part of Project Mercury, it was the fifth human spaceflight, preceded by Soviet orbital flights Vostok 1 and 2 and American sub-orbital flights Mercury-Redstone 3 and 4. The Mercury spacecraft, named Friendship 7, was carried to orbit by an Atlas LV-3B launch vehicle lifting off from Launch Complex 14 at Cape Canaveral, Florida. After three orbits, the spacecraft re-entered the Earth's atmosphere, splashed down in the North Atlantic Ocean, and was safely taken aboard USS Noa. Total mission flight time was four hours 55 minutes and 23 seconds. After the successful completion of the Mercury 5 flight that carried Enos, a chimpanzee, in late November 1961, a press conference was held in early December. Reporters asked NASA's Robert Gilruth who would be the first U.S. astronaut in orbit, piloting Mercury 6. He then announced the team members for the next two Mercury missions. John H. Glenn was selected as prime pilot for the first mission (Mercury 6), with M. Scott Carpenter as his backup. Donald K. Slayton and Walter M. Schirra were pilot and backup, respectively, for the second mission, Mercury 7. The Mercury 6 launch vehicle, Atlas #109-D, arrived at Cape Canaveral the evening of November 30, 1961. NASA had wanted to launch Mercury 6 in 1961 (hoping to orbit an astronaut in the same calendar year as the Soviets did), but by early December it was apparent that the mission hardware would not be ready for launch until early 1962. Mercury spacecraft #13 began taking form on McDonnell's St. Louis, Missouri assembly line in May 1960. It was chosen for the MA-6 mission in October 1960 and delivered to Cape Canaveral on August 27, 1961. Mercury spacecraft #13 and Atlas #109-D were stacked on the pad at Launch Complex 14 on January 2, 1962. As the effects of orbital space flight on humans were unknown except to the Soviets, who were keeping whatever knowledge they had a secret, Glenn was prepared with an onboard medical kit consisting of morphine for pain relief, mephentermine sulfate to treat any shock symptoms, benzylamine hydrochloride to counter motion sickness and racemic amphetamine sulfate, a stimulant. A survival kit was also placed on board to assist Glenn while waiting for recovery after splashdown, including desalter kits, dye marker, distress signal, signal mirrors, signal whistle, first aid kits, shark chaser, a PK-2 raft, survival rations, matches, and a radio transceiver. The launch date was first announced as January 16, 1962, then postponed to January 20 because of problems with the Atlas rocket fuel tanks. The launch then slipped day by day to January 27 due to unfavorable winter weather. On that day, Glenn was on board Mercury 6 and ready to launch, when, at T-29 minutes, the flight director called off the launch because of thick clouds that would have made it impossible to photograph or film the launch vehicle after the first 20 seconds of the mission (the inability of launch crews to film the failed Mercury-Atlas 1 launch 16 months earlier had proven the importance of flying only in clear skies). A large crowd of reporters gathered at Cape Canaveral for the launch went home disappointed. Mission Director Walter Williams felt a sense of relief at the bad weather, as there was still a general sense that the spacecraft and booster were not ready to fly yet. NASA informed the anxious public that the mission would take time to get ready since manned launches required a high degree of preparation and safety standards. The launch was postponed until February 1, 1962. When technicians began to fuel the Atlas on January 30, they discovered a fuel leak had soaked an internal insulation blanket between the RP-1 and LOX tanks. This caused a two-week delay while necessary repairs were made. On February 14, the launch was again postponed due to weather. Finally on February 18, the weather started to break. It appeared that February 20, 1962 would be a favorable day to attempt a launch. Glenn boarded the Friendship 7 spacecraft at 11:03 UTC on February 20, 1962 following an hour-and-a-half delay to replace a faulty component in the Atlas's guidance system. The hatch was bolted in place at 12:10 UTC. Most of the 70 hatch bolts had been secured, when one was discovered to be broken. This caused a 42-minute delay while all the bolts were removed, the defective bolt was replaced and the hatch was re-bolted in place. The count was resumed at 11:25 UTC. The gantry was rolled back at 13:20 UTC. At 13:58 UTC the count was held for 25 minutes while a liquid oxygen propellant valve was repaired. At 14:47 UTC, after two hours and 17 minutes of holds and three hours and 44 minutes after Glenn entered Friendship 7, engineer T. J. O'Malley pressed the button in the blockhouse launching the spacecraft. O'Malley said, "the good Lord ride all the way," and then capsule communicator Scott Carpenter uttered the famous phrase "Godspeed, John Glenn." Due to a glitch in Glenn's radio, he did not hear the Carpenter phrase during launch. At liftoff Glenn's pulse rate climbed to 110 beats per minute. 30 seconds after liftoff the General Electric-Burroughs designed guidance system locked onto a radio transponder in the booster to guide the vehicle to orbit. As the Atlas and Friendship 7 passed through max Q Glenn reported, "It's a little bumpy about here." After max Q the flight smoothed out. At two minutes and 14 seconds after launch, the booster engines cut off and dropped away. Then at two minutes and twenty-four seconds, the escape tower was jettisoned, right on schedule. After the tower was jettisoned, the Atlas and spacecraft pitched over still further, giving Glenn his first view of the horizon. He described the view as "a beautiful sight, looking eastward across the Atlantic". Vibration increased as the last of the fuel supply was used up. Booster performance had been nearly flawless through the entire powered flight. At sustainer engine cut-off it was found that the Atlas had accelerated the capsule to a speed only 7 ft/s (2 m/s) below nominal. At 14:52 UTC, Friendship 7 was in orbit. Glenn received word that the Atlas had boosted the MA-6 into a trajectory that would stay up for at least seven orbits. Meanwhile, computers at the Goddard Space Flight Center in Maryland indicated that the MA-6 orbital parameters appeared good enough for almost 100 orbits. When the posigrade rockets fired and separated the capsule from the booster, the five-second rate-damping operation started two and a half seconds late. This caused a substantial roll error as the capsule began its turnaround. The automatic attitude control system took 38 seconds to place Friendship 7 into its proper orbital attitude. The turnaround maneuver used 5.4 pounds (2.4 kg) of fuel from a total supply of 60.4 pounds (27.4 kg): 36 lb (16 kg) for automatic and 24.4 lb (11.1 kg) for manual control system. The spacecraft then settled into orbital flight with a velocity of 17,544 miles per hour (28,234 km/h). Friendship 7 began its first orbit with all systems go. It crossed the Atlantic and passed over the Canary Islands. Controllers there reported all capsule systems in perfect working order. Looking at the African coastline, and later the interior over Kano, Nigeria, Glenn told the tracking station team that he could see a dust storm. Kano flight communicators replied that the winds had been quite heavy for the past week. Over Kano, Glenn took control of the spacecraft and started a major yaw adjustment. He allowed the spacecraft to continue the yaw maneuver until it was facing into its flight path. Glenn noticed that the attitude indicators disagreed with what he observed was the true spacecraft attitude. Even with the incorrect instrument readouts, he was pleased to be facing forward instead of backward on his orbital path. Over the Indian Ocean, Glenn observed his first sunset from orbit. He described the moment of twilight as "beautiful". The sky in space was very black, he said, with a thin band of blue along the horizon. He said the sun set fast, but not as quickly as he had expected. For five or six minutes there was a slow reduction in light intensity. Brilliant orange and blue layers spread out 45 to 60 degrees on either side of the sun, tapering gradually toward the horizon. Clouds prevented him from seeing a mortar flare fired by the Indian Ocean tracking ship as part of a pilot observation experiment. Continuing his journey on the night side of Earth, nearing the Australian coastline, Glenn made star, weather, and landmark observations. He looked for but failed to see the dim light phenomenon known as the zodiacal light; his eyes had insufficient time to adapt to the darkness. The spacecraft came into radio range of Muchea, Australia. At the Mercury Tracking Station there, Gordon Cooper was the capsule communicator. Glenn reported that he felt fine and had no problems. He saw a very bright light and what appeared to be the outline of a city. Cooper said that he probably was looking at the lights of Perth and its satellite town of Rockingham. This turned out to be correct; many people in Perth turned on their lights so as to be visible to Glenn as he passed over. "That sure was a short day," he excitedly told Cooper. "That was about the shortest day I've ever run into." The spacecraft moved across Australia and across the Pacific to Canton Island. Glenn experienced a short 45 minute night and prepared the periscope for viewing his first sunrise from orbit. As the sun rose over the island, he saw thousands of "little specks, brilliant specks, floating around outside the capsule"; he momentarily felt that the spacecraft was tumbling or that he was looking into a star field. A quick hard look out of the spacecraft window corrected the illusion and Glenn was sure that the "fireflies", as he called them, were streaming past his spacecraft from ahead. They seemed to flow by slowly but did not seem to be coming from any part of the spacecraft, and they disappeared as Friendship 7 moved into brighter sunlight. It was later determined that they were probably small ice crystals venting from onboard spacecraft systems. "I am in a big mass of some very small particles, they're brilliantly lit up like they're luminescent. I never saw anything like it. They round a little: they're coming by the capsule and they look like little stars. A whole shower of them coming by. They swirl around the capsule and go in front of the window and they're all brilliantly lighted." Glenn started banging the capsule wall and watched the "fireflies" come off, just as Alan Shepard did. As the spacecraft crossed the Kauai, Hawaii tracking station, Glenn noticed a lot of interference on the HF radio band. As he crossed the Pacific coast of North America, the tracking station at Guaymas, Mexico, informed Mercury Control in Florida that a yaw thruster was causing attitude control problems. Glenn later recalled, this problem "was to stick with me for the rest of the flight". Glenn noticed the control problem when the automatic stabilization and control system allowed the spacecraft to drift about a degree and a half per second to the right. Glenn switched control to manual-proportional control mode and moved Friendship 7 back to the proper attitude. He tried different control modes to see which used the least fuel to maintain attitude. The manual fly-by-wire combination used the least fuel. After about twenty minutes the yaw thruster began working again and Glenn switched back to the automatic control system. It worked for a short time and then began having problems again, this time with the opposite yaw thruster. He then switched back to the manual fly-by-wire system and flew the spacecraft in that mode for the remainder of the flight. As Friendship 7 crossed Cape Canaveral at the start of its second orbit, flight systems controller Don Arabian  noticed that "Segment 51", a sensor providing data on the spacecraft landing system, was giving a strange reading. According to the reading, the heat shield and landing bag were no longer locked in position. If this were the case, the heat shield was only being held against the spacecraft by the straps of the retro package. Mercury Control ordered all tracking sites to monitor "Segment 51" closely and advise Glenn that the landing-bag deploy switch should be in the "off" position. Glenn was not immediately aware of the problem, but he became suspicious when site after site asked him to make sure that the landing-bag deploy switch was off. Meanwhile, Friendship 7 was crossing the Atlantic for the second time. Glenn was busy manually keeping the spacecraft attitude correct and also trying to accomplish as many of the flight plan tasks as he could. Crossing over the Canary Islands, Glenn observed that the "fireflies" outside the spacecraft had no connection with gas from the reaction control jets. His suit temperature felt too warm, but he did not take time to adjust it. The Kano, Nigeria and Zanzibar sites suddenly noticed a 12 percent drop in the spacecraft secondary oxygen supply. During his second pass over the Indian Ocean, Glenn found that the Indian Ocean tracking ship was in heavy weather. The tracking station had planned to release balloons for a pilot observation experiment, but instead the ship fired star-shell parachute flares as Friendship 7 passed overhead. Glenn was able to observe the flashes of lightning from storms in the area but was unable to see the flares. The temperature in Glenn's spacesuit was too warm. It had been since he passed over the Canary Islands, earlier in the second orbit. As he crossed the Indian Ocean he tried to adjust the suit temperature. As he approached Woomera, Australia, a signal light came on warning him of excess cabin humidity. For the rest of the flight Glenn had to carefully balance suit cooling against the cabin humidity. While he was still over Australia, another warning light came on, indicating that the fuel supply for the automatic control system was down to 62 percent. Mercury Control recommended that Glenn let the spacecraft attitude drift to conserve fuel. There were no more problems for Friendship 7 during the remainder of the second orbit. Glenn continued to manually control the spacecraft attitude, not allowing it to drift too far out of alignment. In doing so, he consumed more fuel than a functioning automatic system would have used. Fuel consumption was 6 pounds (2.7 kg) from the automatic tank and 11.8 pounds (5.4 kg) from the manual tank, during the second orbit. This amounted to almost 30 percent of the total fuel supply. On the third orbit of Friendship 7, the Indian Ocean tracking ship did not attempt to launch any objects for pilot observation experiments, as the cloud coverage was still too thick. When the spacecraft came across Australia for the third time, Glenn joked with Cooper at the Muchea Tracking Station. Glenn asked Cooper to notify General Shoup, Commandant of the Marine Corps, that three orbits should meet the minimum monthly requirement of four hours' flying time. He also asked to be certified as eligible for his regular flight pay. During Glenn's orbits, Mercury Control had been monitoring the problem with "Segment 51". The Hawaiian tracking station asked Glenn to toggle the landing bag deploy switch into the automatic position. If a light came on, reentry should take place while retaining the retro pack. Given the earlier questions about the landing bag switch, Glenn realized the controllers must have found a possible problem with a loose heat shield. The test was run but no light appeared. Glenn also reported there were no bumping noises during spacecraft maneuvers. Mercury Control was still undecided on the course of action to take. Some controllers thought the retrorocket pack should be jettisoned after retrofire, while other controllers thought the retro pack should be retained, as added assurance that the heat shield would stay in place. Flight Director Chris Kraft and Mission Director Walter C. Williams decided to keep the retro pack in place during reentry. Walter Schirra, the California communicator at Point Arguello, relayed the instructions to Glenn: the retro pack should be retained until the spacecraft was over the Texas tracking station. After the mission was over, the "Segment 51" warning light problem was later determined to be a faulty sensor switch, meaning that the heat shield and landing bag were in fact secure during reentry. Glenn was now preparing for reentry. Retaining the retro package meant he would have to retract the periscope manually. He would also have to activate the 0.05-g sequence by pushing the override switch. Friendship 7 neared the California coast. It had been four hours and 33 minutes since launch. The spacecraft was maneuvered into retrofire attitude and the first retrorocket fired. "Roger. Retros are firing. ... Are they ever. It feels like I'm going back toward Hawaii. ", Glenn radioed. The second and then the third retros fired at five-second intervals. The spacecraft attitude was steady during retrofire. Six minutes after retrofire; Glenn maneuvered the spacecraft into a 14-degree nose up, pitch attitude for reentry. Friendship 7 lost altitude in its reentry glide over the continental United States, and headed toward splashdown in the Atlantic. The Texas tracking station told Glenn to retain the retro pack until the accelerometer read 1.5 g (14.7 m/s2). Glenn reported as he crossed Cape Canaveral he had been controlling the spacecraft manually and would use the fly-by–wire mode as a backup. Mercury Control then gave him the 0.05 g (0.49 m/s2) mark, and he pressed the override button. About the same time, Glenn heard noises that sounded like "small things brushing against the capsule". "This is Friendship 7 - a real fireball outside," he radioed Mercury Control. A strap from the retro package broke partially loose and hung over the spacecraft window as it was consumed in the reentry plasma stream. The spacecraft control system was working well but the manual fuel supply was down to 15 percent. The peak of reentry deceleration was still to come. Glenn switched to fly-by-wire and the automatic tank supply. This combination had more available fuel. The spacecraft now experienced peak reentry heating. Glenn later reported, "I thought the retro pack had jettisoned and saw chunks coming off and flying by the window." He feared the chunks were pieces of his heat shield that might be disintegrating. The chunks were pieces of the retro package breaking up in the reentry fireball. After passing the peak g region, Friendship 7 began oscillating severely. The astronaut could not control the ship manually. The spacecraft was oscillating past 10 degrees on both sides of the vertical zero-degree point. "I felt like a falling leaf," Glenn later said. He activated the auxiliary damping system, this helped stabilize the large yaw and roll rates. Fuel in the automatic tanks was getting low. Glenn wondered if the spacecraft would retain stability until it was low enough to deploy the drogue parachute. The automatic fuel supply ran out at 1 minute and 51 seconds, and manual fuel ran out at 51 seconds, before drogue chute deployment. The oscillations resumed. At 35,000 feet (10 km), Glenn decided to deploy the drogue chute manually to regain attitude stability. Just before he reached the switch, the drogue chute opened automatically at 28,000 feet (8.5 km) instead of the programmed 21,000 feet (6.4 km). The spacecraft regained stability and Glenn reported, "everything was in good shape." At 17,000 feet (5 km) the periscope opened and was available for the astronaut to use. Glenn tried to look out the overhead window instead, but it was coated with so much smoke and film that he could see very little. The spacecraft continued to descend on the drogue chute. The antenna section jettisoned and the main chute deployed and opened to its full diameter. Mercury Control reminded Glenn to manually deploy the landing bag. He toggled the switch and the green light confirmation came on. A "clunk" could be heard as the heat shield and landing bag dropped into place, four feet (1.2 m) below the capsule. The spacecraft splashed down in the North Atlantic at coordinates near 21°20′N 68°40′W﻿ / ﻿21.333°N 68.667°W﻿ / 21.333; -68.667, 40 miles (64 km) short of the planned landing zone. Retrofire calculations had not taken into account spacecraft weight loss due to use of onboard consumables. USS Noa, a destroyer code-named "Steelhead", had spotted the spacecraft when it was descending on its parachute. The destroyer was about 6 miles (9.7 km) away when it radioed Glenn that it would reach him shortly. Noa came alongside Friendship 7 seventeen minutes later. One crewman cleared the spacecraft antenna and another crewman attached a line to hoist Friendship 7 aboard. After being pulled from the water the spacecraft bumped against the side of the destroyer. Once Friendship 7 was on deck, Glenn intended to leave the capsule through the upper hatch, but it was too hot in the spacecraft and Glenn decided to blow the side hatch instead. He told the ship's crew to stand clear and hit the hatch detonator plunger with the back of his hand. The detonator plunger recoiled, and slightly cut the astronaut's knuckles through his glove. With a loud bang, the hatch was off. A smiling Glenn got out of Friendship 7 and stood on the deck of Noa. His first words were, "It was hot in there." The astronaut and spacecraft came through the mission in good shape. After the return of Friendship 7 NASA had announced on April 19, 1962 that the spacecraft would be lent to the United States Information Agency for a world tour. The tour included more than 20 stops, becoming known as the "Fourth orbit of Friendship 7". 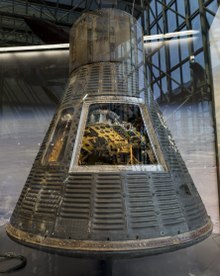 Mercury spacecraft # 13 – Friendship 7 – is currently displayed at the National Air and Space Museum, Washington D.C. On February 21, 1962, a metal fragment was recovered on a farm near Aliwal-North, South Africa. It was identified as coming from the MA-6 Atlas launch vehicle by numbers stamped on it. The fragment had landed on the farm after about eight hours in orbit. The fragments were recovered by the police and handed over to NASA, which returned it as a token of goodwill. The fragments are today on display in the Science Museum in Pretoria. 3 14 Feb 1962, 12:00:00 am scrubbed 15 days, 0 hours, 0 minutes weather "Unfavorable weather conditions"
00:00:00 Liftoff Mercury-Atlas lifts off, onboard clock starts. 00:00:02 Roll Program Mercury-Atlas rotates along its axis 2.5 deg/s from 30 to 0 deg. 00:00:16 Pitch Program Mercury-Atlas begins a 0.5 deg/s pitch from 90 to 0 deg. 00:00:30 Radio Guidance Lock General Electric-Burroughs guidance system locks onto radio transponder in Atlas booster to guide the vehicle until orbit insertion. 00:02:10 BECO Atlas Booster Engine Cutoff. Booster engines drop away. 00:02:33 Tower Jettison Escape Tower Jettison, no longer needed. 00:02:25 Atlas Pitchover After tower separation, vehicle pitches over further. 00:05:24 Capsule Separation Posigrade rockets fire for 1 s giving 15 ft/s (4.57 m/s) separation. 00:05:25 5 second Rate Damping ASCS damps capsule rates for 5 seconds in preparation for turnaround maneuver. 00:05:25 Turnaround Maneuver Capsule (ASCS) system rotates capsule 180 degrees, to heat shield forward attitude. Nose is pitched down 34 degrees to retro fire position. 00:05:30 - 04:30:00 Orbital Operations Orbital operations and experiments for 3 orbits. 04:30:00 Retro Sequence Start Retrofire in 30 s. (ASCS) checks for proper retro attitude -34 deg pitch, 0 deg yaw, 0 deg roll. 04:30:30 Retrofire Three retro rockets fire for 10 seconds each. They are started at 5 second intervals, firing overlaps for a total of 20 s. Delta V of 550 ft/s (168 m/s) is taken off forward velocity. 04:35:45 Retract Periscope Periscope is retracted in preparation for reentry. 04:36:20 Retro Attitude Maneuver (ASCS) orients capsule in 34 degrees nose down pitch, 0 degrees roll, 0 degrees yaw. 04:42:15 .05 G Maneuver (ASCS) detects beginning of reentry and rolls capsule at 10 deg/s to stabilize capsule during reentry. 04:49:38 Drogue Parachute Deploy Drogue parachute deployed at 22,000 ft (6.7 km) slowing descent to 365 ft/s (111 m/s) and stabilizing capsule. 04:49:45 Snorkel Deploy Fresh air snorkel deploys at 20,000 ft (6 km) ECS switches to emergency oxygen rate to cool cabin. 04:50:20 Landing Bag Deploy Landing Bag Deploys, dropping heat shield down 4 ft (1.2 m). 04:50:20 Fuel Dump Remaining hydrogen peroxide fuel automatically dumped. 04:55:30 Splashdown Capsule lands in water about 500 mi (800 km) downrange from launch site. 04:55:30 Rescue Aids Deploy Rescue aid package deployed. The package includes green dye marker, recovery radio beacon and whip antenna. Philip Kaufman's 1983 film The Right Stuff includes a dramatization of the Friendship 7 mission in which Ed Harris plays Glenn. The sequence depicts the spacecraft's three orbits and Glenn's responses to what he saw, sometimes quoted verbatim, as well as the concerns over the heat shield during reentry. The mysterious "fireflies" are also shown, but their true explanation is not revealed; instead they are depicted as magical protection summoned by Australian Aborigines at the Muchea Tracking Station. The 2016 film Hidden Figures features the Friendship 7 mission in the climax of the movie, focusing on Katherine Johnson's calculations of the landing. On February 20, 2012, to commemorate the 50th anniversary of the flight, Glenn was surprised with the opportunity to speak with the orbiting crew of the International Space Station while Glenn was on-stage with NASA Administrator Charlie Bolden at Ohio State University, where the public affairs school is named in honor of Glenn. Wikimedia Commons has media related to Friendship 7. ^ "Mercury-Atlas 6". NASA. November 20, 2006. Retrieved November 15, 2018. ^ "Mercury Atlas 6 NSSDCA/COSPAR ID: 1962-003A". NASA. ^ a b "Operational Phase of Project Mercury". ^ "For John Glenn, it's one more mission". Feb 12, 2012. ^ "Project Mercury Chronology". NASA. ^ a b c d "Operational Phase of Project MercuryOperational Phase of Project Mercury". Project Mercury, A Chronology. NASA History Office. ^ The Voyage of Friendship 7 (Film/DVD). Washington, D.C.: NASA. 1962. Official NASA film of the flight, this version from the NASA 25 Years DVD released by Madacy Entertainment Group Inc. in 1998. ^ Siceloff, Steve (2009-11-13). "Famed Engineer O'Malley Dies at age 94". NASA News & Features. Retrieved 2009-11-14. O'Malley is perhaps best known as the man who pushed the button to launch the Atlas rocket that carried astronaut John Glenn into orbit on Feb. 20, 1962. ^ John Noble Wilford (28 October 1998). "At Cape Canaveral, Reliving the Grand Highs of '62". New York Times. ^ Barbara Maranzani (8 December 2016). "7 Things You May Not Know About John Glenn". History.com. ^ Gene Kranz (2001). "God Speed, John Glenn". Failure Is Not an Option: Mission Control from Mercury to Apollo 13 and Beyond. Simon and Schuster. p. 68. ISBN 978-0-7432-1447-6. ^ Grimwood, James M. (1963). "Project Mercury: A Chronology" (PDF). NASA report SP-4001. NASA. Retrieved 19 December 2016. ^ Franko, Kantele (20 February 2012). "Armstrong honors Glenn 50 years after his orbit - NASA also surprised Glenn with space station chat". MSNBC.com. Retrieved 21 February 2012. Wikimedia Commons has media related to Mercury-Atlas 6. "Mercury 6 Audio Collection". Retrieved 2018-07-04.